Step 1Bring a pot of water to a boil with potatoes. Cook approximately 20 minutes. Step 2Drain the potatoes and add them back to the pot. Step 3Mash until almost smooth with a potato masher and then add vegan cream cheese, baobab powder, soymilk, salt, pepper, and olive oil. Mix all. Step 4Add whole-wheat flour and all-purpose flour. Step 5Heat waffle iron and spray well with non-stick cooking spray. 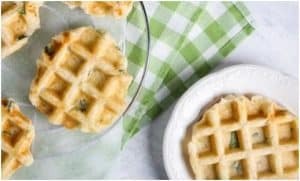 Place 1 heaped tablespoon of potato mixture into each waffle cavity. Step 6Serve with your favourite sauce on top.